Trying to get the cylinder head off and thought I could jack the engine Up with the mount loosened only to discover there is a plate under the engine has to come out to get a jack on it. Beginning to warm to the idea of pulling the head with exhaust attached. Don’t have a hoist, not sure even if I buy/rent one I can get it home (my other car is a Boxster). Have seen an engine support tool at harbor freight but not sure I can get it tall enough to clear. Don’t really want to take the AC stuff off either. Why not just remove the plate? Bentley says one time use bolts and has to retorqued on the ground etc. Not like the plastic skid plate. Mostly because I’m less inclined to crawl under then I used to be. On a few M62 engines I could get all the bolts off using my "Dr Seuss" ratchet. It was definitely a challenge to get to some. Some I reached from under most from above but beats taking off the header. Caveat: when installing likey to be some pent up stress on the exhaust you'll need to overcome to get the head aligned onto the alignment sleeves. You can likely just use a prybar to push. I used a floor jack under part of the exhaust to help position the exhaust header but also a rescue pulley hoist to pull the head over once a couple exhaust bolts were finger tight. I put a 15" adjustable wrench into the tow eye in the bumper so I could pull on something attached to the car (I didn't want to use something that would pull the car off the jack stands). This worked great. The other guy helping already bolted on the header with the head not aligned. I didn't want to undo and redo the 8 header bolts so I used some muscle enhancer to pull the head over. Worked fine. I think I used a shim to hold the head up to protect the head gasket while moving it over. I raise my X5 from front center with the stiffen plate all the time. I use a block of wood to fit up in the little space. They make a piece of aluminum designed just for the X to fit into the body corner lift sockets that would work perfectly for the under engine center lift. I doubt you can get to the exhaust bolts without removing the skid plate* anyhow and it's only 6 bolts so it'll be one of the easiest parts of the job. Just put the back four in so you can test drive before putting the stiffening plate* back on. * The plate has multiple jobs but it's easier to type skid. PS: Bentley can "suckit" on single use bolt on the stiffening plate. You can absolutely reuse they are not head bolt! lol. Rube Goldberg would be proud. So far haven’t gotten past getting the middle exhaust to the header bolts out. Pretty rusty. Only using a 1/2 in ratchet but guess I need to put more PB Blaster on and pull out my shop air and impact wrench. So I noticed there is a small hatch in the plate, are you saying I might could get some engine lift with a jack through that space? I’m going to leave the intake laying in the engine bay. Too much aggravation getting the brake vaccum line out and the fuel line is hard to get to. Thanks for the great pics. Yankee engenuity at its finest. Musta been beer involved. BMW identifies the plate as a reinforcement plate. The primary function is to stiffen the front suspension. The bolts are torque to yield. Once they have been tightened to the proper torque they cannot be torqued properly again. That is the reason BMW states they are one time use. In spite of the warning most reuse the bolts. I think the reason is based on the cost per bolt rather than any expert knowledge of the amount of risk. I don't reuse them--from past discussions I am one of few that don't. That plate is commonly called the "stiffening plate." You are pretty much required to remove that one way or another doing your HG job. Re-use of those bolts has been extensively discussed on here. Most, including me and it seems all BMW dealer and independent mechanics agree that they can be re-used, but the re-torquing must be modified. True believers disagree and pay up. I removed the exhaust manifolds with the head in place. Yes, about half the studs came out with the nuts; I dealt with that once the head was out. Based on my experience with my 2001 3.0i, I think it would be very difficult (or close to impossible) to remove the head with the exhaust manifolds in place. 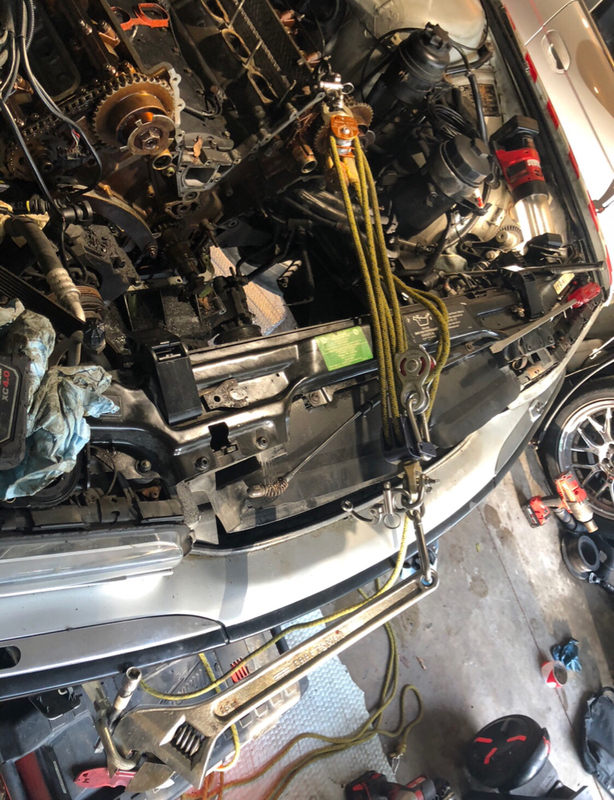 I don't think it is possible to remove the exhaust manifolds and reinstall them with the stabilizer bar (sway bar, roll bar, anti-roll bar) in place. And to loosen and relocate that, will require removal of the stiffening plate. "errors" I found in the entire process. That VANOS error was pretty minor - like they referred to something as an o-ring, when in fact it was an Aluminum washer. Drop the entire exhaust, starting at the back. I found I "needed" to do that for reinstallation. Yes, possible without this, but on my car it was easy to drop it all, and helped with the wrestling match up at the exhaust manifolds. Remove stiffening plate. Save the bolts and nuts for re-use. Remove all ~20 exhaust manifold 11mm nuts, expect about half of those to come out with their studs. I think I tried some of them from below, but got all of them from above. Of course, disconnect O2 sensors on both ends of the exhaust manifolds. Will need to partially disconnect stabilizer bar. For me (2001 3.0i) installation was tougher than removal, and I think I ended up (in addition to the full exhaust removal) removing the right front wheel and fully disconnecting the stabilizer bar. 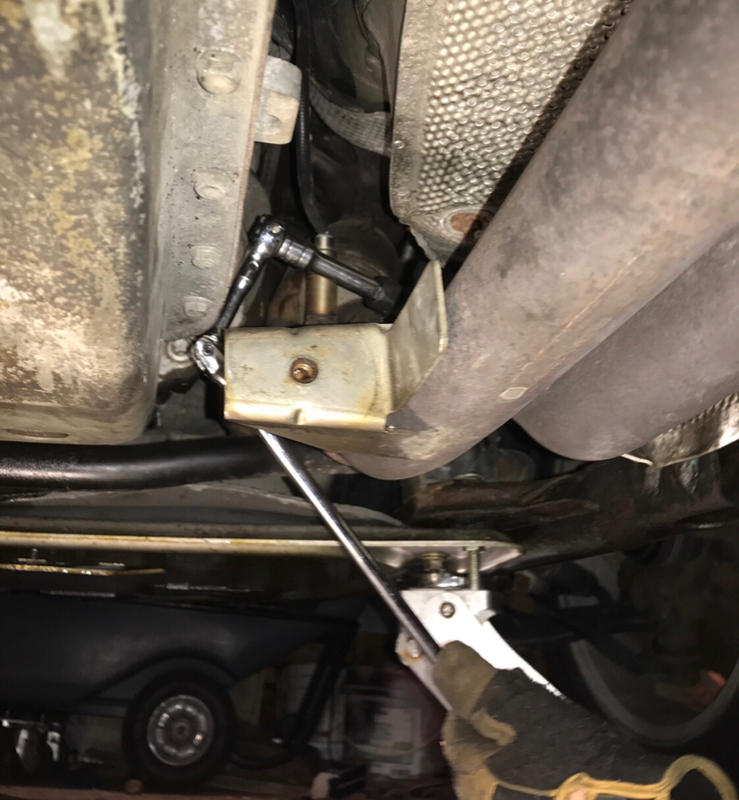 But for exhaust manifold removal, I just needed to partially disconnect the stabilizer bar. Even after fully disconnecting the bar, I was barely able to re-fit the exhaust manifolds past it. But removing the bar completely would have required some more disassembly, so I did not do that. With the manifolds out and the head on the bench. After taking all the necessary studs out (some are required to be removed for machining), and having the machine shop do the test, clean, and machine, I cleaned and reinstalled all the studs. You'll want high temp red loctite for this and a few other things. Probably more details on this from some of my posts in later 2018. I really appreciate you guys keeping up and the detailed descriptions. If given the opportunity, the beers on me. Once I get psst rusty bolts to the exhaust (step 1) I’ll have a better idea. Got sidelined today with wife’s doctor visit.